From the 1690s until their removal from Illinois, the Potawatomi lived along the Calumet, Chicago, and Des Plaines Rivers in Du Page and Cook counties. They established close economic and social ties with French fur traders. As American settlers gained influence in the Upper Mississippi Valley, the Potawatomi began to resist encroachments on their territory. During the War of 1812 the Potawatomi sided with the British, and on August 15, 1812, a hostile band attacked Fort Dearborn which burned to the ground. 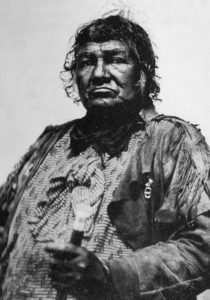 Chief Shabbona, a great-nephew of the Ottawa chief Pontiac, fought in Pontiac’s Rebellion and was with Tecumseh when he died during the British defeat at the Battle of the Thames in 1813. After Tecumseh’s defeat the Potawatomi sought peace with the United States, and in 1816 they began receiving tribal annuities from the U.S. government. From 1816 to 1829, the Potawatomi entered into seven treaties in which they ceded more of their land to obtain additional stipends. Despite his prior alliance with Tecumseh and Pontiac, Chief Shabbona became an important liaison between the white settlers and Native Americans. In 1827, he dissuaded members of the Winnebago from going to war against the white settlers. Shabbona also kept the Potawatomi from joining the Sauk leader Black Hawk’s war against white settlements along the Rock River. Shabbona had witnessed the military superiority of the United States Army. A friendly visitor to many early pioneer homes including Joseph Vial in Lyons Township and Israel Blodgett in Downers Grove Township, Chief Shabbona traveled across northern Illinois warning settlers to go to Fort Dearborn to find protection from Black Hawk’s attack. After Black Hawk’s defeat in 1832, the United States government increased its efforts to relocate Native Americans from their ancestral territory to west of the Mississippi River. In 1833 thousands of Potawatomi, Ojibwe, and Ottawa gathered in Chicago to relinquish their land in northern Illinois and southern Wisconsin in the Treaty of Chicago. 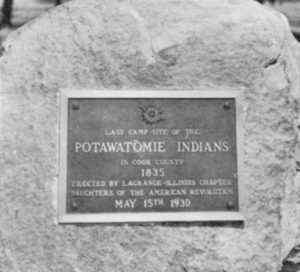 Over several years the Potawatomi left Illinois in small groups. As the last Potawatomie left Chicago, they camped on the Joseph Vial farm along what is now Plainfield Road west of Wolf Road. 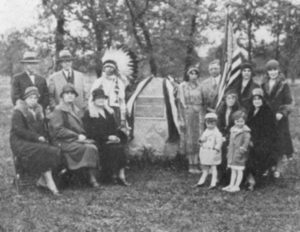 On May 5, 1930, the La Grange chapter of the Daughters of the American Revolution held a commemorative ceremony to dedicate a historic marker noting the last camp site of the Potawatomi in Cook County. During the ceremony, Alice Vial read entries from her grandfather Joseph Vial’s diary that described life as a pioneer. Joseph Vial’s great grandchildren Muriel and William Vial drew the ribbons to unveil the granite boulder used as the historic marker. This marker still stands at the northwest corner of Wolf and Plainfield Roads.